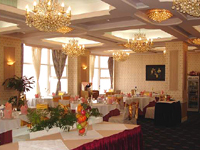 The hotel boasts several Chinese and western restaurants, as well as a bar. For recreation, there is a fitness room, billiards room, chess room, sauna, mini golf, dancing hall, KTV and beauty salon. The hotel also provides a ticket reservation service. Three minutes by foot to the Shanghai Everbright Convention & Exhibition Center.